Iran's nuclear chief says the unfinished Arak reactor could be modified to produce less plutonium in a bid to reassure the West. Iran's nuclear chief, Ali Akbar Salehi, said on Thursday that the unfinished Arak reactor could be modified to produce less plutonium in a bid to reassure the West, AFP reports. The Arak site is of concern to Western nations because Tehran could theoretically extract weapons-grade plutonium from its spent fuel if it also builds a reprocessing facility, potentially giving it a second route to an atomic bomb. "Here we can do some design change ... in order to produce less plutonium in this reactor and in this way allay the worries and mitigate the concerns," Salehi said, according to a transcript of his interview with the English-language Press TV. "Weapon-grade plutonium is not produced by this reactor. This reactor will produce about 9 kilograms of plutonium, but not weapon-grade plutonium," Salehi added. "This reactor is a research reactor. 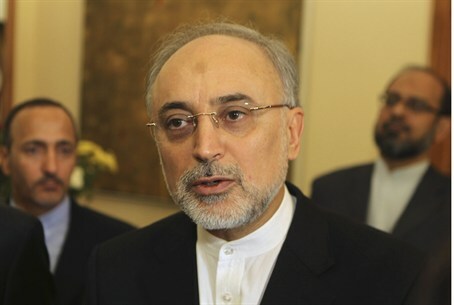 It is for the purpose of producing radio-isotopes and making other tests," Salehi said, adding that Iran does not intend to build a reprocessing plant. The Arak heavy water plant had been a sticking point in negotiations between Iran and the West. Satellite images from almost a year ago showed that the plant was operational, raising fears that it is trying to produce plutonium for a nuclear bomb. In December, shortly after a landmark deal was reached between Iran and the West, UN nuclear inspectors arrived in Iran to visit Arak for the first time in more than two years. A top U.S. diplomat, Wendy Sherman, said earlier this week that Iran did not need some of its nuclear facilities, including the Arak reactor, in order to have a peaceful program. She made similar comments in an interview with PBS two months ago, saying a final agreement with Iran would include “a lot of dismantling of their infrastructure” and would likely entail a demand that Iran dismantle the Arak reactor. “Quite frankly, we're not quite sure what you need a 40-megawatt heavy water reactor, which is what Arak is, for any civilian peaceful purpose,” Sherman said at the time. When asked why Iran will not abandon the Arak reactor, Salehi said "it is a scientific achievement, it is a technological achievement... We see no point stopping the work on this reactor." Salehi added that the reactor could not be brought online for at least three years. Under the interim nuclear deal struck in November, Iran agreed to roll back parts of its nuclear work in exchange for the release of billions of dollars in frozen assets and limited relief from crippling sanctions. It also committed not to make further advances at its Arak, Fordo and Natanz facilities. The interim agreement, which took effect January 20, is intended to buy time for the negotiation of a comprehensive accord that would resolve the decade-long impasse over Iran's nuclear program. According to Mark Fitzpatrick, a former State Department official now at the International Institute for Strategic Studies, changing Arak's design so that it cannot produce weapons-grade plutonium might be something the world powers press for in the final accord. At the same time, Iranian officials have repeatedly stressed that the country would never give up its nuclear program or its right to enrich uranium. Iranian President Hassan Rouhani told CNN recently that even under the deal, Iran still had a right to peaceful nuclear technology, including enrichment, which he described as "part and parcel of the inalienable rights of states."